Remember the days when accession to the World Trade Organization was seen as an admittance ticket into the global economy, a prize hugely desired by China and other developing nations? Things have changed slightly in recent years, ever since the WTO embarked in 2001 on the Doha Development Round of negotiations, which was aimed at establishing an overarching multilateral trade agreement. After 12 years of failing to reach an agreement on that proposal—or even coming close to reaching an agreement on that proposal—the Geneva-based organization’s credibility has been shot. But on December 7 on the Indonesian island of Bali, the trade group did something startling. It produced a trade accord—its first since it was launched in 1995. Remarkably, all 159 member nations voted to ease customs and port clearance restrictions, a move that the Washington, DC-based Peterson Institute for International Economics estimates will create $1 trillion in economic activity and 21 million jobs. Beyond that, the deal may have saved the WTO. Certainly, the organization’s glacial pace has led a number of countries to forge old-style bilateral trade agreements among themselves, or work toward establishing regional groupings like the Trans-Pacific Partnership. The current negotiations between the US and the European Union on updating rules on the $4 trillion trade in services are more focused than WTO initiatives and, according to some, more relevant to the 21 st century global economy. In truth, many of the world’s largest trading nations or regional blocs had effectively given up on the WTO coming to an agreement on any part of the Doha Round, let alone an overarching multilateral trade accord. The organization’s new director-general, Roberto Azevêdo of Brazil, knew this, too, and therefore presented the delegates meeting in the resort town of Nusa Dua with a very modest package for streamlining customs procedures in the hope of winning an agreement. Even so, diplomats had to defuse a row between the US and India over food subsidies and then head off a last minute revolt by Cuba and its Latin American allies who hoped to end the US embargo of the Caribbean island. Azevêdo hailed the deal. 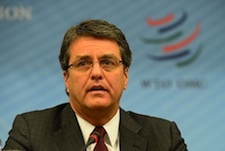 "For the first time in our history,” the director-general said at the closing ceremony, “the WTO has truly delivered." Whether the WTO can use its refurbished credibility to push through other parts of the Doha Round remains to be seen. But at the very least, the outcome in Bali will give renewed clout to the organization in its other role as international trade cop and dispute arbiter. That policing function is needed more than ever with the proliferation of bilateral and regional agreements—a proliferation fanned, perversely enough, by the WTO’s inability to get anything done in 18 years.